There are times when my outer children reach in and grab my inner child by the hand and pull her out to dance around the house. But at Christmas, my inner child steps out all by herself, grabs everyone by the hand and takes no prisoners. I know, I know, it’s only November. Mid-November at that. But I’m one of those really annoying people who love Christmas so much, I start shopping in September. I can’t help myself….. I just love being Santa’s little helper. I normally hate shopping. I’d rather be naked than bustle busily in crowded shops at sale time. But Christmas? Bring it on! If there is a website on gifts, I’ve surfed it. If there is a catalogue, I’ve flicked it. If there’s a shop, I’ve browsed it…. although this year I’ve added arts and crafts websites to my list in an attempt to make some presents and cut back on costs. I’m actually giddy with girlie glee at the prospect of decorating the new house and seeing my girls shine in the glow of the fairy lights. And it seems my Festive Fever is catching…. 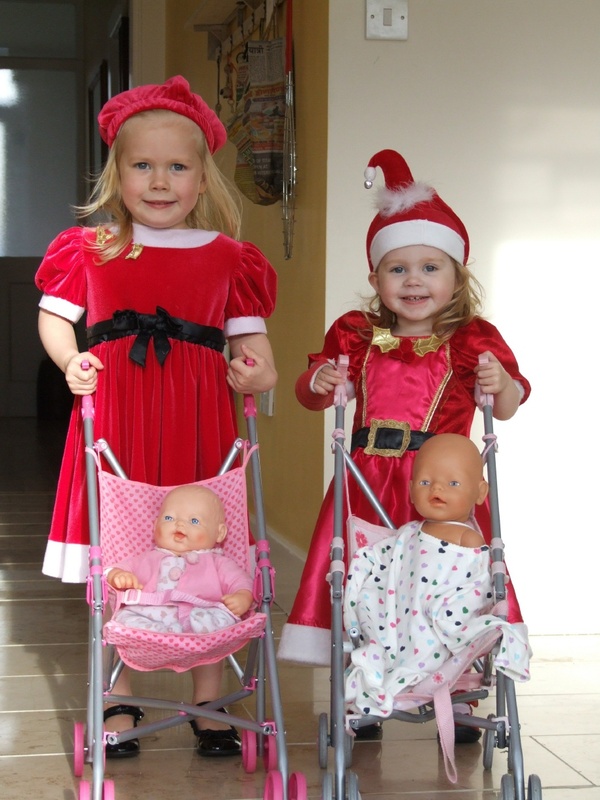 Daisy and Poppy have been wearing their Santa dresses since August! So to kick off the jolly season, and get us all in the mood, here are my top ten reasons why Christmas is cracking…. 1. It fuels my fury for colour coded charts and love of lists. With presents to buy, family to entertain, a house to decorate I am in UBER List Mode…. a state of near delirium. My fridge is a veritable rainbow of charts, and I’m showing great self-restraint by not producing the glitter highlighter pens until December. 2. I have a rather worrying penchant for tacky decorations – we have more singing snowmen, laughing Santa’s and glowing Rudolfs than Hamley’s toy store… Ho Ho Ho. 3. It’s an excuse to go shopping, even if the stuff isn’t for me. And let’s be realistic, prams weren’t really designed with children in mind… sure walking is better for them anyway. Prams are the ultimate bag carrier. 4. I get to eat the Christmas Tree shaped cookie that the girls and I make on Christmas Eve for Santa, reluctantly leaving one solitary chocolate chip on the plate to show how hungry he was. 5. I get to drink a very nice bottle of red, in front of the fire with hubby on Christmas eve as we wrap presents and stuff stockings. 6. It’s the only time of year I can realistically get away with wearing something sparkly and not look like mutton dressed as lamb. 7. I get to add another wine choice to my evening splurge…. white, red, rose and mulled… oh the decisions. 8. Eating. Lots. Of. Chocolate. I do this all year anyway, but now I can do it guilt-free. 9. We are allowed to forget the limited TV rule, and curl up on the sofa in front of the fire and watch the Snowman with the girls. 10. Watching their faces on Christmas morning when they realise that Santa really has come down the chimney and left them presents. Christmas will be a little leaner this year, but that’s ok…because the best parts of Christmas are priceless. May I be the first to wish you all a Merry Christmas! Oh, I love Christmas too. I've just done a load of on-line shopping and am feeling very virtuous and organised indeed. Thanks for your comments on my blog too by the way! funny, i've been singing/humming 'winter wonderland' since i awoke this am. i love the christmas spirit, too. maybe not quite the way you do, but close.